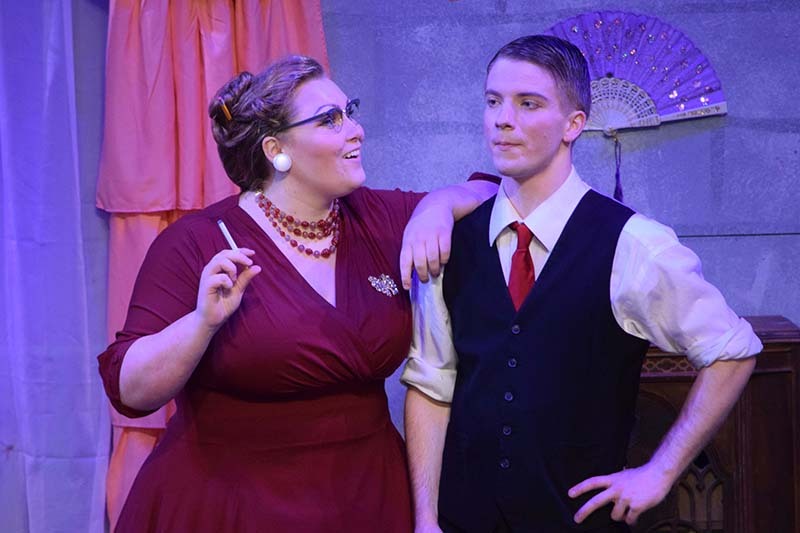 The Blinn College-Brenham Campus Theatre Arts Program recently earned state-wide recognition at the 2019 Texas Community College Speech & Theatre Association (TCCSTA) Play Festival in Mesquite. Blinn-Brenham’s production of George Axelrod’s “Will Success Spoil Rock Hunter?” earned a Superior rating for the overall production. Tyler Regan received the Greg Schneider Technical Excellence Award for lighting design, a prestigious award presented to a student making the most outstanding technical contribution at the play festival. Regan also received Professors’ Choice and Respondents’ Choice Excellent Awards in Technical for lighting design. Jackie Andrade received a Respondents’ Choice Superior Award and Professors’ Choice Excellent Award in Technical for makeup design. In addition, Professors’ Choice Excellent Awards in Technical went to Kaylee Reidenbach for stage management, Megan Flores and Tyler Roberts for assistant stage management, Isabela Silva for properties design, and Kiarra Pruitt for sound design. Respondents’ Choice Excellent Awards in Technical went to Pruitt for properties design, and Eva Kirby and Flores for costume running crew. Kirby and Nicki Pinter received Respondents’ Choice Superior Awards in Acting for their roles as Rita Marlowe and Sally Irving. Pinter also received a Professors’ Choice Acting Award. In addition, Respondents’ Choice Excellent Awards in Acting went to Amanda Storey for her role as Violet Logan and Zachary Hopkins for his role as George MacCauley. Roberts and Christopher Velasquez received Audience Choice Acting Awards and Respondents’ Choice Special Merit Awards for playing production assistants. Nies directed the play, Kevin Patrick served as technical director, and Jennifer Patrick served as costume designer. Blinn-Brenham hosted the production at the Dr. W.W. O’Donnell Performing Arts Center on Feb. 14-17 with over 400 attending the public performances and around 100 students from La Grange and Onalaska high schools attending the preview performances. The Texas Community College Speech and Theatre Association has actively enriched the lives of Texas Community College students since 1922. It provides an opportunity for two-year colleges to share their work in a festival setting, receiving awards and important feedback from educated theatre critics. Blinn’s Division of Visual/Performing Arts and Kinesiology offers an Associate of Arts in theatre arts, which explores the fundamentals of theatre, including hands-on experience both on and off the stage. Blinn hosts a variety of student performances in a wide range of theatrical genres each year and provides students the opportunity to learn from professional performers who visit the campus as part of the College’s Performing Arts Series.